This story was submitted to the People’s War site by Christine Wadsworth of Wakefield Libraries and Information Services on behalf of Don Nicholls and has been added to the site with his permission. The author fully understands the site’s terms and conditions. These are some of my memories of the years during the 1939-45 War. War was declared on the 3rd September, the day before my 13th birthday. I had been to Sunday School and on the Sunday morning after Sunday School we were told to go to Glasshoughton Junior and Infants School to be issued with gas masks. I remember my parents putting blackout curtains up at the windows and the air raid warnings that for a short spell in 1941, went off on a regular basis at 7pm. One of the main things I remember are soldiers being billeted in the Methodist Sunday School Institute situated at the top of the steps leading from Leeds Road up to School Lane. 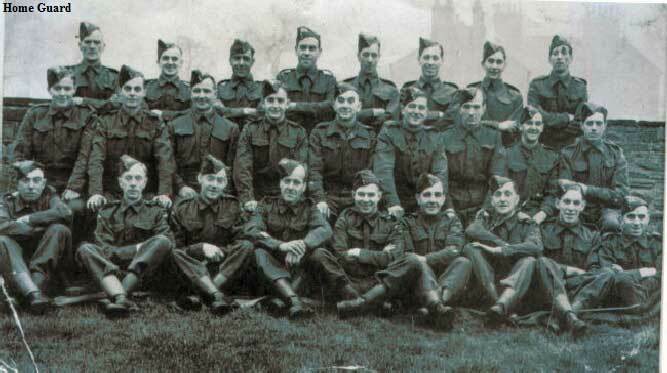 They said that they had been rescued after Dunkirk – I think that they were the Royal West Kent Regiment. After leaving school at 14 years old, I got a job at Wilf Poskitts in Airedale, making and repairing crates for Lumb’s Bottle Works. After a short spell – this was in the early part of the War – I was asked to do fire watching duty. We were given a bucket of water, a bucket of sand and a stirrup pump in case any incendiary bombs were dropped on the timber yard. My next job was with J L Rodgers, who were building contractors and had joined up with both Poskitts and a firm of plumbers and electricians. These contractors worked together and managed to get a firm contract with the Govenment building and maintaining army camps in the local area. This was quite interesting and enjoyable work. Some of the places we were employed at were Methley Hall Estate which belonged to the Earl of Mexborough, Hickleton Hall near Doncaster the home of Lord Halifax and Byram Park and Pontefract Barracks. We also worked on numerous farms and farm buildings that had been commandeered by the Army and needed repairs and maintenance. Methley Hall was a base for the Royal Artillery and had a big searchlight battery. Pontefract Barracks was a training depot for the ATS. Another army camp was erected in the stands on Pontefract racecourse – I think that this would be in the years 1942-43. We put nissan huts alongside the main stand. The soldiers billeted there formed the Reconnaissance Regiment and were fitted out with scout cars and light scouting vehicles for the Desert Campaign. During the early years of the War I joined the 294 Squadron of the Air Training Corps and did my squarebashing in the playground of the then Boys Modern School. I was 18 on the 4th September ’44 and got my calling up papers to join the army six weeks later in October 1944. My basic training was for the first six weeks, which I did at Ballykinder Barracks in Northern Ireland. After this I was posted to the Royal Engineers and after a spell at Southhampton went on through France, Belgium, Germany, Austria and then to Northern Italy. I was then posted to Egypt, Palestine and Trans Jordan attached to the First Armoured Division, which took me through to my demob from the Army in February 1948. After serving with the Royal Engineers in countries across the world, I was glad to get back home to see my parents and family. This entry was posted in Methley Historical Events and tagged methley 1939 - 1945, methley at war, methley life and times.